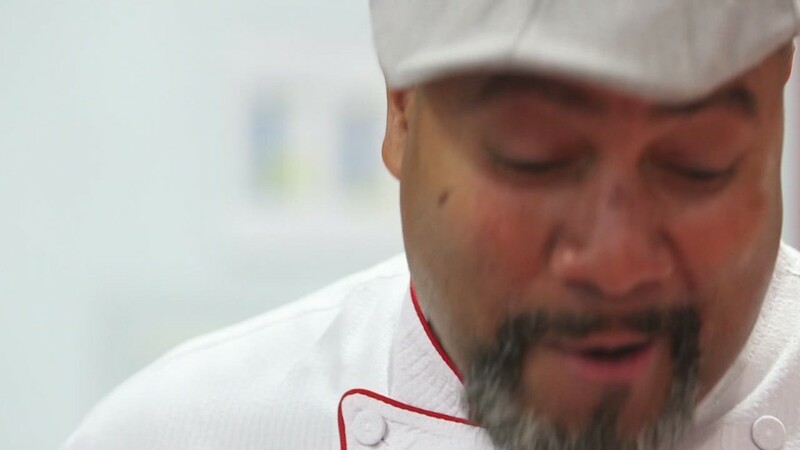 Fried chicken fans, rejoice. The Colonel is back. 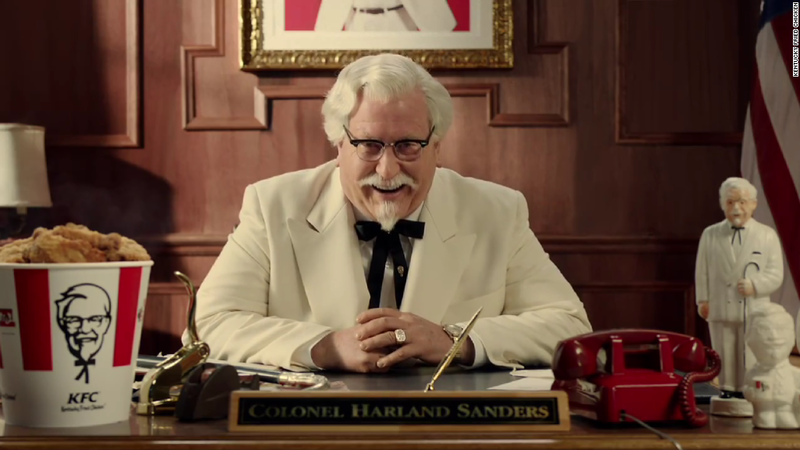 KFC is resurrecting Colonel Sanders for its latest ad campaign. The real Harland Sanders, who created the chain's famous secret recipe, died in 1980. But KFC owner Yum! Brands (YUM) has a series of new commercials featuring Darrell Hammond -- most famous for impersonating Bill Clinton on "Saturday Night Live" -- playing Sanders. A video appeared on YouTube Tuesday with Hammond, dressed as Sanders, giving "The State of Kentucky Fried Chicken Address." KFC is also remodeling its stores' interiors and exteriors and will roll out several new products, such as Kentucky baked beans, Finger Lickin' Good Sauce and lemonade from Dole. And in a bit of a curious move, KFC also is rolling out a video game based on Colonel Sanders' life called ColonelQuest that is described as a 6 level, 8 bit "Atari" style game. That's not the real Colonel Sanders. Or Bill Clinton. It's comedian Darrell Hammond. All of this is to celebrate KFC's 75th anniversary. The retro kitsch may be well-received by Gen Xers who still love the 80s. But will this nod to the past attract millennials, a demographic that all fast food chains are desperately trying to reach? 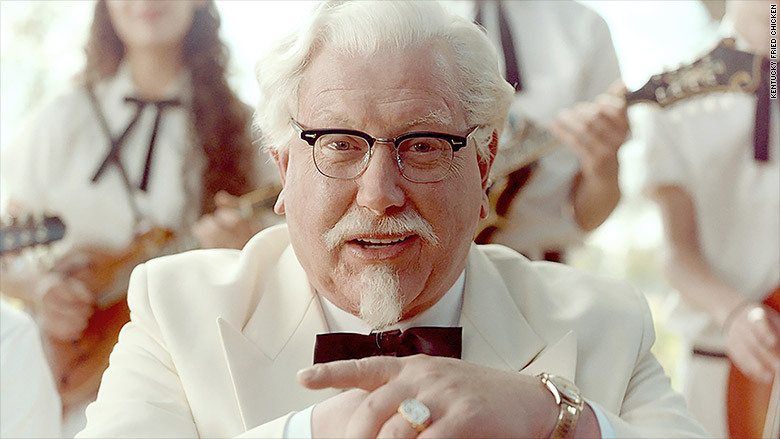 Interestingly, KFC is taking a page from McDonald's marketing book by resurrecting an old ad icon. The Golden Arches just brought back the Hamburglar. Yum, which also owns Pizza Hut and Taco Bell, is doing better than McDonald's (MCD). Taco Bell has made life miserable for McDonald's lately by launching a full-blown fast-food breakfast war. But Yum's overall sales growth still lags far behind the so-called fast casual restaurant upstarts like Chipotle (CMG), Panera (PNRA) and Shake Shack (SHAK). KFC's U.S. sales have been decent but not spectacular. And the company is still trying to turn around Pizza Hut. Despite new menu items, Papa John's (PZZA) and Domino's (DPZ) continue to be tough competitors. Several activist investors have also recently announced stakes in Yum with the hopes of shaking things up at the company. Some are urging Yum to spin off its China division, which accounts for nearly half of its overall sales but has struggled lately due to concerns about food safety. Most of Yum's stores in China are KFC restaurants. So while Hammond joked in the KFC press release that the company was paying him in chicken, he might want to ask Yum for some Learn Mandarin CDs from Rosetta Stone if he really wants to be an effective spokescolonel for KFC in 2015.